the southwest to dirty up the city. while tongues go back to licking ribs. so someone can take the blame. smells like past and premonition. I suddenly want to lick. nods between sips of mocha frap. You remind me of someone I will forget. become a man, learn to be jaded. you wish to save, but can only pity. refuses to come, even after we have. piecing together the lost two years. We could never love each other. before the east calls me home. And I’m too old for you anyway. we are no longer familiars. the flyover states an ocean. fast life, waiting for an earthquake to come. and dead end job, writing poems about the wind. at the edge of the stage. she's got fire eating her alive. becomes Vieux Carre anytime pre-K.
waving like she's second lining. break sweat, body cut loose, firebird from ash. COLLIN KELLEY is an award-winning poet and playwright from Atlanta. His debut novel, Conquering Venus, has just been released by Vanilla Heart Publishing. 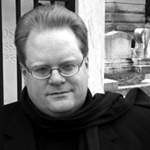 His poetry collections include After the Poison, Slow to Burn, and Better to Travel, which was nominated for the 2003 Georgia Author of the Year Award, Kate Tufts Discovery Award, and Lambda Literary Award. He is a multiple Pushcart Prize nominee and a recipient of the 2007 Georgia Author of the Year/ Taran Memorial Award from the George Writers Association at Kennesaw State University for his work as co-editor of the Java Monkey Speaks Anthology series from Poetry Atlanta Press. His poetry, essays, and interviews have appeared in magazines, journals, and anthologies around the world, including the recently released My Diva: 65 Gay Men On the Women Who Inspire Them. His play, The Dark Horse, was the recipient of the 1994 Deep South Festival of Writer's Award for Best Play from the University of Louisiana and the Georgia Theatre Conference Award in 1997. For more, visit www.collinkelley.com.